Human Brachiocephalic Artery Endothelial Cells (HBcAEC) along with human aortic (HAOEC), carotid artery (HCtAEC), coronary artery (HCAEC) and subclavian artery (HScAEC), all from Cell Applications, Inc., have been used to demonstrate that not only blood vessels from different tissues are highly heterogeneous, they also interact differently with leukocytes during the inflammation response. The authors further showed that differential N-glycosylation of commonly expressed vascular adhesion molecules may be responsible for this heterogeneity, as well as for modulation of signaling under resting and activated inflammatory conditions. This also explains why specific vascular beds may be more or less susceptible to particular diseases or stimuli. Importantly, if cells from different sources were used, these results could not be convincingly validated due to a number of uncontrolled variables, such as age, race, genetic variability or life style choices of the donors. To eliminate the donor-to-donor variability, the scientists took advantage of the great variety of primary cells offered by Cell Applications, including the option of ordering a panel of endothelial cells obtained from different vascular beds of the same donor! 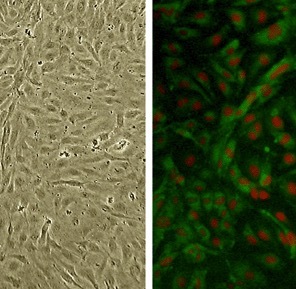 Human Brachiocephalic Artery Endothelial Cells :HBcAEC (L). HBcAEC immunolabeled for vWF (green); nuclei are counterstained with PI (red) (R). Scott, D.W., M.O. Vallejo, and R.P. Patel. 2013. Heterogenic endothelial responses to inflammation: role for differential N-glycosylation and vascular bed of origin. Journal of the American Heart Association, 2:e000263-e000263.